With a sleek new frame and lower price, the Vision V-Series indoor cycle is more competitive than ever when compared to higher end bikes. The high-inertia 40-lb flywheel and friction brake system deliver a smooth, consistent ride. Check out the popular V-Series bike on sale now at Vision Fitness! The brake system on the Vision V-Series exercise bike uses felt pads that are both long lasting and easy to maintain. 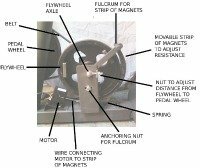 The tension (resistance) is smoothly transitioned via a large knob with a rubber grip; press the knob for braking. The stainless steel seat pop-pin post has height and fore/aft adjustments, and the 5-position handlebars have a fore and aft slider. Other features of this indoor cycle include a steel frame with a zinc oxide polyester powder coating, standard alloy pedals with straps, and high carbon steel cranks. The multi-hand position handlebars include a straight bar for an extra comfortable stance when standing. 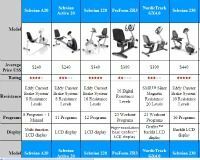 Options: Add the large 3"x 2" blue backlit LCD computer ($179) for feed back data including time, distance, RPM, calories, and heart rate. The computer is wireless and mounts directly to the handlebars for a seamless look, and it is compatible with a Polar® wireless heart rate receiver. You can also add Combi SPD pedals ($100) and In-Home Assembly ($75). Spin bikes are used by athletes training for road races and triathlons, as well as by the general public in high-octane Spinning classes all over the world. The V-Series bike is rated for both home and commercial use and is one of just a few bikes at this price point that will adjust to fit a taller user. 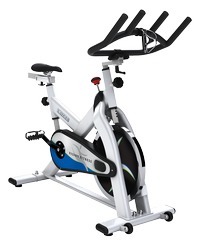 The Vision V-Series indoor cycle even allows the flexibility to add a first-rate training computer. Priced at just $1,199, it rates a Good Buy.